Ichiban UK is a company that prides itself in employing all resources into one thing; specialising in the art of sushi making. Very much in sync with the companies ethos is the name ‘Ichiban’, which directly translates as ‘number one’. Ichiban is the UK’s largest sushi provider and have been for over a decade, operating since 2007 out of their site in Earl Stoneham, Suffolk. The scale that the business is operating; coupled with the demands of a 24/7 production schedule extends particular pressures and demand on labour, logistics, timings, refrigeration and, most importantly for FTD, equipment and machinery. 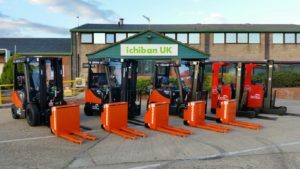 With maintenance and servicing costs rising on the forklifts and materials handling equipment they’d had since moving to their Suffolk site, the management at Ichiban decided it was time for a change. This presented Fork Truck Direct with an exciting opportunity, and FTD’s Jimmy Pacavage proposed a deal to replace the entire fleet of equipment – promoting the quality, reliability and value of the Doosan product, and highlighting the unrivalled service support and customer care that FTD provide. After careful deliberation, reviewing all of the options put to them, Ichiban decided that FTD were the ‘number one’ choice! The new equipment was delivered, on schedule, last month and FTD are extremely proud to be working with such a great and well established company.